Living Space: 2700 sq. ft. 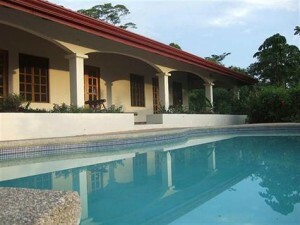 This 4 bedroom, 2 bathroom home is only minutes from the center of Uvita but it very private and has it’s own gated entry. It is aprox 1/2 km up a gravel road from the paved coastal highway and very close to many of the areas beautiful beaches. It has a spectacular northern ocean view which captures ocean sunsets all year round. There is also a caretakers house on the property. There is currently a caretaker living there that would be happy to stay with a new owner. They maintain the property and can help deal with renters if the new owner wishes. This house has it all….access, privacy, space, views, a pool, landscaping, gated entry, and a great feel. I’ll let the pictures do the talking!! !